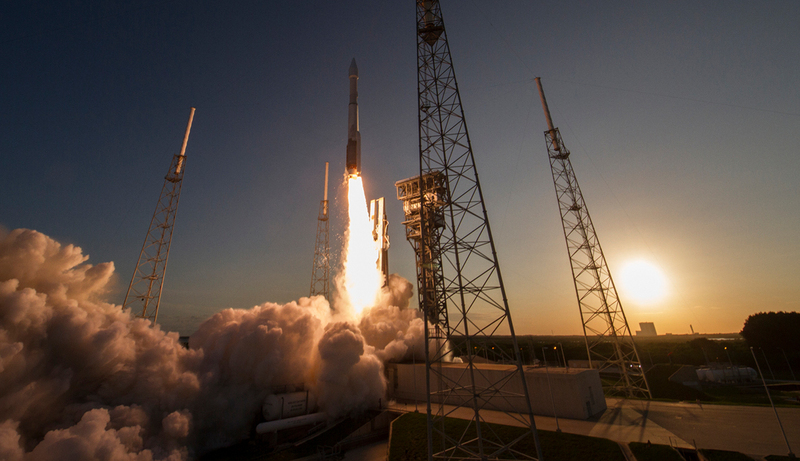 Explanation: Near sunset on Thursday, clear skies saw the launch of the OSIRIS-REx spacecraft. Sporting a single solid rocket booster, its Atlas V vehicle blasts off from Cape Canaveral's Complex 41 in this low, wide-angle view toward launch pad and setting Sun. OSIRIS-REx is bound for Bennu, scheduled to encounter the mountain-sized asteroid in 2018. First the spacecraft will swing back by home world planet Earth though, for a gravity assist maneuver to boost it on its way. After a detailed survey of Bennu OSIRIS-REx will collect a sample from the asteroid's surface in 2020 and bring it home, returning to Earth in 2023. If all goes well it will be the largest sample returned by a space mission since the Apollo era.